One of the big drawbacks of running your own web business is your reliance on web hosting technology. Statistics show that the average web host is down for over two and a half hours each month, but for some hosts it is much worse than this. If you web host is down, your whole business is completely shut down. Potential customers arriving at your site will simply click away to your competitors. Existing customers and users may be frustrated and go elsewhere. Worst of all, expensive advertising and pay-per-click costs will be wasted. Although most web hosting companies monitor their servers regularly, they do so at the server level, not through accessing the hosted websites. There are many faults that do not show up at the server level, which means that websites can be down for considerable periods without anyone even knowing about it. This problem has led to many site monitoring services being set up, which continually check websites and tell the owner (usually by email) if the site goes down. This allows the website owner to contact his or her hosting company to get the site restored as soon as possible. The drawback with these services is that they generally involve paying a monthly fee. Even $10 a month can soon mount up, especially if you're just starting out. Accessing this type of online service also generally lacks the convenience and ease of use offered by a Windows software tool. Now there's a quick and easy completely FREE alternative, which runs on your own PC, continually monitoring all your websites automatically. 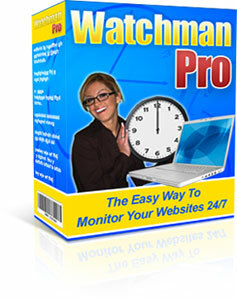 Simply download Watchman Pro, run it (no installation needed) and enter all the web addresses you want to monitor. Watchman Pro will hide itself in your system tray (the area at the bottom right of your screen where the clock appears). Whenever you are connected to the Internet, the software will silently probe each of your websites every 10 minutes (or at any other interval selected by you). Simply double-click on the system tray icon and Watchman Pro will show itself, allowing you to see more details of the problem - and allowing you to check the site with your Internet browser, just by clicking a button. The software can also optionally send an email to any email address, so you can be notified of the problem even if you are away from your PC. As soon as you know that your site is down, you can contact your web hosting company, to get them working on the problem as soon as possible. Watchman Pro is intended to be fully automatic, running in the background permanently whenever your PC is switched on. It will activate automatically at Windows startup and shut down automatically when Windows closes down. (You can choose not to use this feature and activate the software manually if you prefer). The software will automatically monitor your Internet connection and will check your sites whenever you are connected to the Internet. All this means that once you've set up Watchman Pro, you can just forget about it and let it get it on with its job. Watchman Pro can also be used to monitor web pages for changes. You can monitor as many different pages as you want - on any websites anywhere - just by typing the URLs into the software. The software will take a record of the contents of the web page and notify you whenever the page changes. You will even get notified if the page changed overnight when your PC was switched off. You can use this to monitor blogs, article sites, user groups or any other type of site. Watchman Pro shows an ad each time it is activated. If you would prefer not to see these ads, you can pay for an ad-free version of the software. Requirements: Watchman Pro is for use on PCs running Microsoft Windows XP (home or Pro version) or Windows Vista. It should work with any web site and any web host. 24/7 monitoring requires your PC to be permanently connected to the Internet (the software can only monitor while it is connected). However when monitoring web pages for changes, the software will store details of the page so changes will be detected even if the page changes while the software is not running.